We have ten people who live in our house. Me, my husband, my grandmother (she’s 88!) and our youngest seven kids. Not only that, I also homeschool. There are always people around. There is always noise. And believe it or not, I’m an introvert. I thrive on quiet. 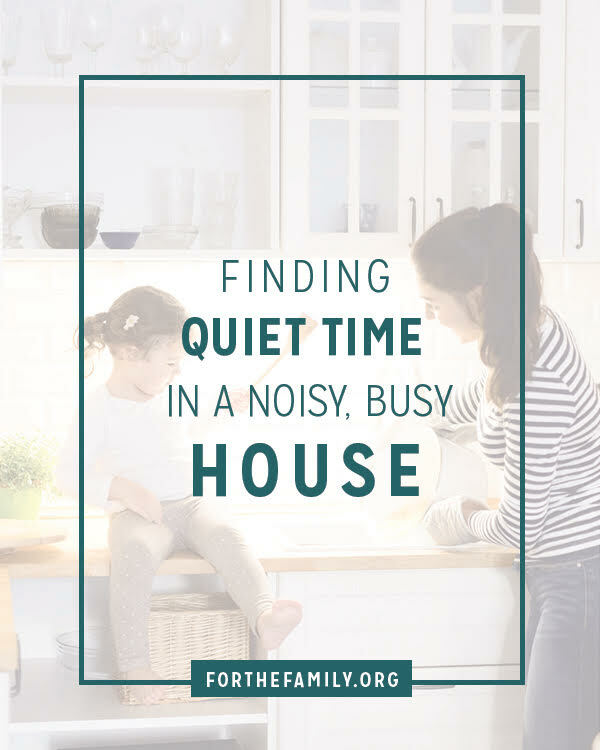 So how do I find quiet times in a noisy, busy house? How can you, too? Get up early. This is a habit I started when I only had three kids. I try to wake up at least an hour before everyone else to have time to read my Bible, to pray and for my mind and spirit to recharge. Give yourself a timeout. I love afternoon naps, but with a house full of kids that’s not always possible. Even when I can’t nap I often give myself a “time-out” around 3:30 p.m. I lay down and rest in my room (with the door open so I can listen to the kids). I try to relax and re-focus on God. I pray about concerns of the day. “Escape” even in the middle of the busyness. For me, my escape may including folding laundry and listening to a podcast or music. Amazingly few people bother me in the laundry room … they’re afraid I’ll put them to work! Hire help. For many years I hired my college-age son to watch the younger kids for a few hours in the afternoon. He’d play with them outside, take them on walks or take them on an outing. Just having the time and space to work or rest was worth the cost. Plan quiet into your day. Create a natural rhythm of peace. For me, this includes a time of Bible reading, Scripture journaling, and prayer with my kids. We have times when the television goes off (most of the evening). We also enjoy dinner together nearly every night without television or electronics distracting us. Disengage from social media. Even “soundless” media is still noise. It keeps our mind busy, instead of allowing peace. Give yourself times when you do engage online, and then put it away. Which idea excites you the most? Start with that one, and then incorporate more quiet and rest into your life. We all need quiet. We need time to consider our lives and where we’re headed. Mostly, we all need time during our day to connect with God—to remember Him and know Him. Psalm 46:10 says, “Be still, and know that I am God!” Like anything, being still and quiet before God takes practice. But even in the midst of a very busy day, we can take time to breathe, to reflect and find peace.